Any local readers have advice? There must be a few Mennonite stores on the northern border of TN and KY. There is also at least one co-op through Azure Standard in this area, though I haven't been able to get anyone to contact me. No advice - just wanted to say that my toddler ADORES playing with dry macaroni and dry wheat kernels. It's a toss up: is water easier to clean up or the small pieces?? ha. Looks like your kids were playing too, is what I think! Check the internet for co-ops. Also, if you belong to a church or homeschooling group (or know people who do) you can almost bet someone there will know of a co-op. I used to belong to a co-op but now I add to a friend's orders once in awhile. That is where I get my wheat. You should be warned, the price of wheat has more than doubled in the last six months or so. My daughter also grinds wheat for her family and she gets Montana Wheat through someone in New England (where she lives). She was shocked at the increase in prices. There are some stores in Liberty, KY. I'm from the midwest, so this isn't a 'local' tip. I just called my local health food store that carries items in bulk bins. They said they would give me a 10% discount off of the retail price if I ordered in bulk (50 lbs. of organic rolled oats and 25 lbs. of organic dried beans). Try a local store that carries bulk bins. Make sure to ask for a discount :). There are several Mennonite shops in Halfway, Kentucky - which is near Scottsville. I'm sure they have what you'd need. My buddy and I are due to go back in a couple of weeks, I'll look then. There is the Country Pantry, an Amish bulk food store located between Guthrie and Elkton in KY, just over the border from Clarksville off Hwy 79 (exit 4 on I-24). You could look them up. I know there is one(or was) in the Crossville,TN area. I don't know the location or anything, though. I live about ten miles from the Cane Creek Market in Lobelville and we shop there often. However, if you're making a trip in order to buy in bulk, I don't think it's going to be worth your gas and time. Do you mean bulk as in 50 lb. bags of flour? They don't carry that kind of thing. Most of their products are packaged in sizes that are similar to what you find at the grocery store. I am curious about the picture. Were your kids just playing with the grains? 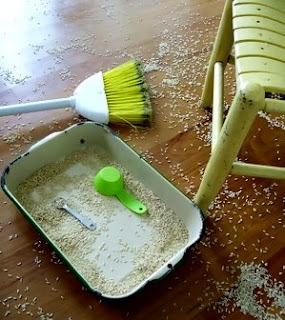 It reminds me of when my sister's grandchildren used to scatter beans and rice on her floor when they were visiting her farm in Tennessee and pretend they were feeding the chickens. She just smiled and swept up when they left and considered it making some good memories of playing at Grandma's house. Some pretty cheap, creative play, if you ask me! I forgot to mention that Morningside Farm in Liberty TN has a Co-op. You can pick up at the farm, or you can go to the delivery site in Murfreesboro. They take orders once a month at www.morningsidefarm.com. There is a Mennonite bulk food store in Hindman, Ky. It is called Yoder's and is just of HWY 80 at the Hindman exit. I love to buy spices, flavoring, and their home baked goods and they also are the cheapest place around for sliced luncheon meats if you use them. oops, they do not sell in bulk, they sell the packaging like in a regular store but it is mostly homemade. If you go to www.breadbeckers.com they offer many grains and beans in bulk. From their website, you can find out whether there is a co-op in your area. I'm a couple years late to get in on the conversation, but I happen to know a great place to buy bulk food in Middle Tennessee - our natural foods coop! We live in Lobelville, TN, where we get HUGE shipments of bulk grains (some from Wheat Montana), bulk fresh fruits, and RAW almonds, among other things. There are several homeschool families who pick up from us and deliver to their own communities in the Gallitin, Jackson, Dickson, Centerville and Lewisburg areas. Check us out at BulkNaturalFoods dot com. The Mennonite community in TN is in Clarkrange and is about 20 miles south of Jamestown off of 127. It's called Muddy Pond General Story. Just Google for phone number and directions. I buy bulk items there but I've never bought bulk wheat. However, I'll be up there in May for my annual horse trip to Big South Fork in May and plan to stock up on other bulk items and I will be checking. I realize I'm a few years late into this conversation but I figure if I was researching it and found it easily, someone else may still run across it and appreciate the information!